Your big brother says whiskey puts hair on your chest, your roommate swore by “beer before liquor, never sicker,” and your ex-girlfriend had some crazy notion that your beer burps weren’t cute. There’s more misinformation about beer and whiskey out there than there are bottles of beer on the wall, and just because the guy on the bar stool next to you claims something as fact, doesn’t mean it’s true. You deserve to know the truth, and you deserve to know it now. Fortunately Jameson Caskmates, the first Jameson whiskey to be finished in casks which previously held stout from Cork’s Franciscan Well brewery, is here to serve it up neat. Misconception #1: Beer should be served ice-cold. The ideal temperature for quality beer is not 10 degrees below glacial. Ice-cold beers numb the palate, dulling the complex aromas and flavors. Experts offer a good rule of thumb: the higher the alcohol content, the warmer the beer should be served. Pilsners, light-bodied lagers, and Hefeweizens, for example, are best served around 40-45º Fahrenheit. Relatively boozy imperial stouts and barley wines call for a balmy 55-60º. Irish stout (like the stuff in the barrels in which Jameson Caskmates is finished) sits comfortably in the middle, with an ideal serving temperature of 45-50º. While some beers are better served at fridge temperature (under 40º), most brews benefit from more moderate temperatures. Misconception #2: Whiskey should only be sipped neat. While whiskey aficionados will debate the addition of ice until last call, most can agree that the first sip of whiskey should always be neat. This is, after all, the drink as its creators intended: un-chilled and undiluted, straight from their distillery to your gullet. Once that first sip is had, though, it’s a free-for-all. While too much ice can have the same flavor-killing effect as overly chilled beer, many enthusiasts go for a large, slow-melting cube or two to gently cool the beverage and mellow the high-alcohol burn. Others, preferring to sip at room temperature, simply add a few drops of spring water. Adding water brings out subtle flavors, which can be important when drinking stronger whiskeys that may taste like little more than a satisfying burn when sipped neat. Ice, on the other hand, can have the opposite effect, numbing the tongue and helping tone down too-intense flavors. Adding either ice or water lowers the ABV (alcohol-by-volume) ratio of your drink: for a 1.5 oz pour, a teaspoon of water will lower the ABV from the standard 40% to a more settled-in-for-the-evening 30%. Jameson Caskmates can likewise be served neat or on ice. Misconception #3: Stouts are more filling than pale brews. While some dark beers have a reputation for being a meal in a glass, not all are created equal — and not all require more treadmill time the next day. The color of beer is related to its malt content: that is, what’s been done to the barley before it’s turned into beer. Brewers strategically halt the barley’s germination process at particular points in time, releasing starch and sugars that then caramelize as the barley is roasted in a kiln. Different roast times produce different colors and flavors, such as “toast” or “chocolate,” but they don’t have the final say on which beers qualify as light. That falls to the alcohol content: it takes more sugar to make more alcohol, so the higher a beer’s ABV, the more sugar and calories it contains. Misconception #4: The grain determines the color of whiskey. Whiskey is distilled from the same grains as beer (effectively making it beer’s more complex older cousin), and its color comes from the oak barrels used to age it. As the goodness mellows in the barrel, that oak adds vanillins and tannins to its complex color and flavor profile. While whiskey that’s been aged longer is often darker, other barrel-related factors also come into play, such as how the barrel was made and whether it had a previous life as a cask for bourbon or sherry. Jameson Caskmates, for instance, is finished in barrels that formerly held Irish stout, lending it notes of chocolate, coffee, and butterscotch. Mmmmm. Misconception #5: Beer gets “skunky” when it’s been left warm for too long. Skunky beer is real (and really sad), but it has very little to do with temperature. That distinctly animal smell is actually due to light interacting with the hops, causing a chemical reaction that causes the beer to go bad. That’s why the color of your beer bottle is more than just an aesthetic matter: while clear ones look great, they don’t work as hard as dark brown bottles to protect your beer from light. 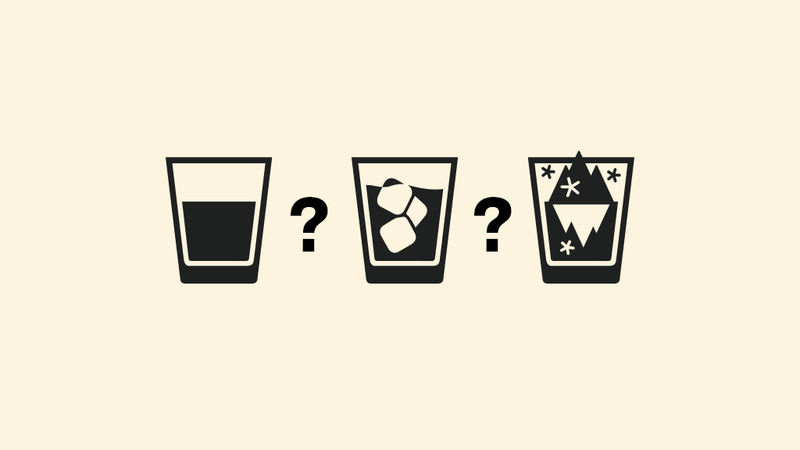 Misconception #6: Whiskey is different than bourbon, scotch, and rye. By definition, whiskey is any alcohol distilled at 40-94.8% ABV from a fermented grain mash — what it’s called when it hits the bottle is essentially a matter of where it got its degree. Bourbon is only produced in the United States, but contrary to popular opinion, doesn’t need to be restricted to Kentucky. It’s made from a grain mixture containing at least 51% corn, giving it a distinctly American flavor profile. Tennessee whiskey is basically bourbon that’s been made in Tennessee. American rye more or less follows the same rules as bourbon and Tennessee whiskey, but swaps the 51% corn rule for 51% rye. Scotch, which comes exclusively from Scotland, is made with malted barley and aged in oak casks for no less than three years. Irish Whiskey is exactly what you’d imagine: grain-mash goodness distilled in Ireland and aged in wooden casks for at least three years. Jameson Caskmates takes this a step further: it’s Jameson’s triple-distilling Irish whiskey, finished in craft beer barrels that previously held Franciscan Well stout. The extra time spent soaking up that stout flavor gives Caskmates its distinctive notes of cocoa, coffee, and a hint of hops. Now that you’re armed with the truth about beer and whiskey, please drink (and debunk) responsibly. The only thing better than a good whiskey after a long day is the joy of telling the story behind it.